On February 26, the Nintendo 3DS is going on sale in Japan. Demand for the product is reaching close to the fever pitch that the DS Lite experienced when it released in Japan in 2006. So those looking to turn a quick buck, er yen, can. A photo snapped apparently outside Japanese retail chain Mandai Shoten in Yamanashi Prefecture shows the buy-back price for an unused Nintendo 3DS on February 26, which is a whopping ¥32,000 (US$387). The 3DS is going on sale in Japan for ¥25,000 or $303. 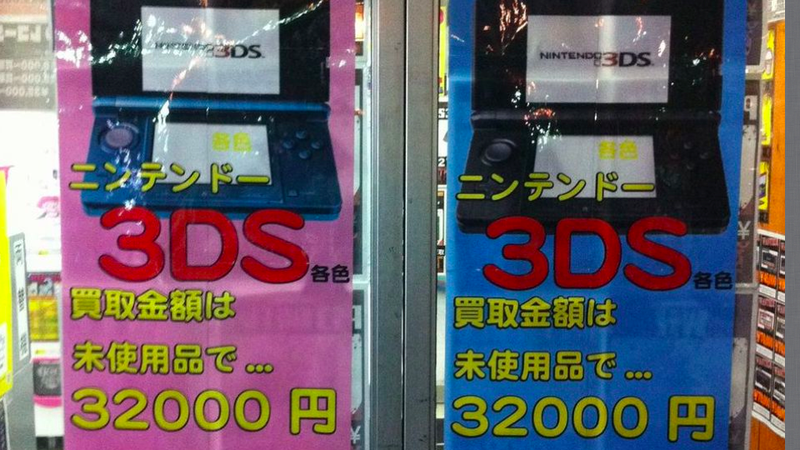 The price is higher than what the 3DS will retail for in the U.S. due to the strong Japanese yen. Some Japanese netizens say that is lower than what the 3DS will fetch online in auction sites come February 26, but this guaranteed buy-back price for this specific chain should provide a glimpse of the gray market to come.